X-4 Stormwing Planes are back, but not in default playlists. 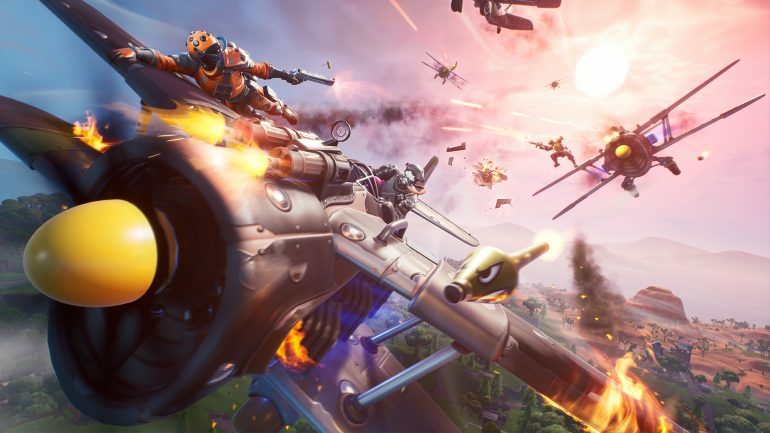 Planes are back in Fortnite: Battle Royale for the first time in season eight, according to the v8.40 patch notes. Don’t worry about people endlessly complaining about their return, though, because Epic brought them back only for a new Limited Time Mode called Air Royale. This mode is more than the standard Duos battle royale experience with planes. Instead of having the option to pilot an X-4 Storming, players are forced to be on one at all times since touching the ground will eliminate them. Related: Epic Games to detail anti-cheating efforts in a Fortnite game integrity blog this week. Air Royale will be the first Fortnite mode to feature a storm with a ceiling that gradually lowers during the match, so planes will be forced to fly lower every time the storm starts closing. As with any storm in Fortnite, it’ll cause damage to players who fly in it. Epic also had to adapt chest and loot spawning in this mode since players can’t touch the ground. Chests fall from the sky instead of being on the ground, and players must fly through them to receive their content (and a short boost for their plane). If the items are poorer quality than the ones players already have, they’ll give players additional ammo, while higher-quality items will automatically replace the lower-quality ones. Players will be able to check out the Air Royale game mode starting today when the server downtime for the v8.40 is over.